Hello once again and thank you for viewing my review of the Steam Crave Glaz RDSA which was sent directly from https://shop.steamcrave.com for this review. Most vapers will know the name Steam Crave, at least the ones who frequent vape forums, there not as well know in local vape shops in my area. Steam Crave products always get oohhhs and ahhhs whenever I visit one of these shops though, the quality is easily apparent. Steam Crave is one of those companies who does not rush products to market, you won’t see a new products once a month like other companies. In my experience this usually pays off with well thought out and excellent performing products with few exceptions. 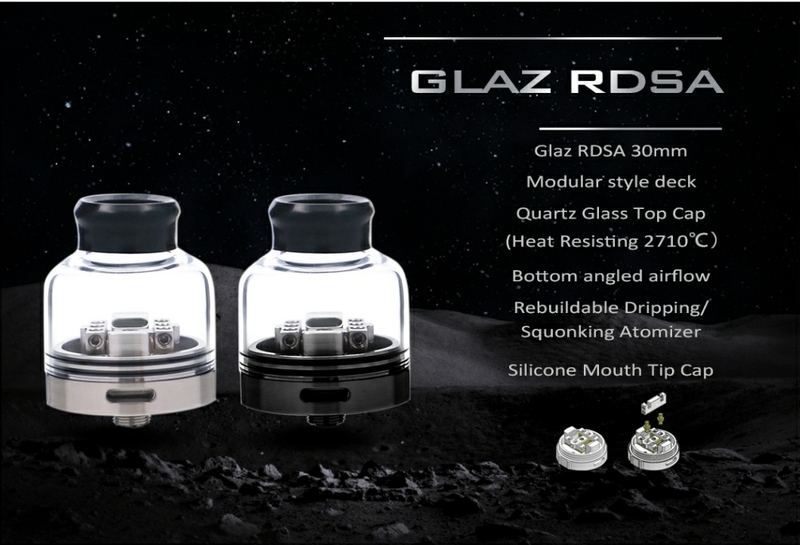 There new line is the Glaz series which includes the RDSA which is up for review here and the RTA which uses a similar build deck and glass chimney. I have both on hand, the RTA review will be coming real soon, same day if annoying work doesn’t get in the way. The Glaz RDSA up for review here comes with a bunch of build options, you can easily do a dual, single or series build with the included series post. There are so many options and space on the Glaz modular deck you could easily do a triple or quad coil. The series post doubles the ohms rather than halves it like a traditional dual coil build. 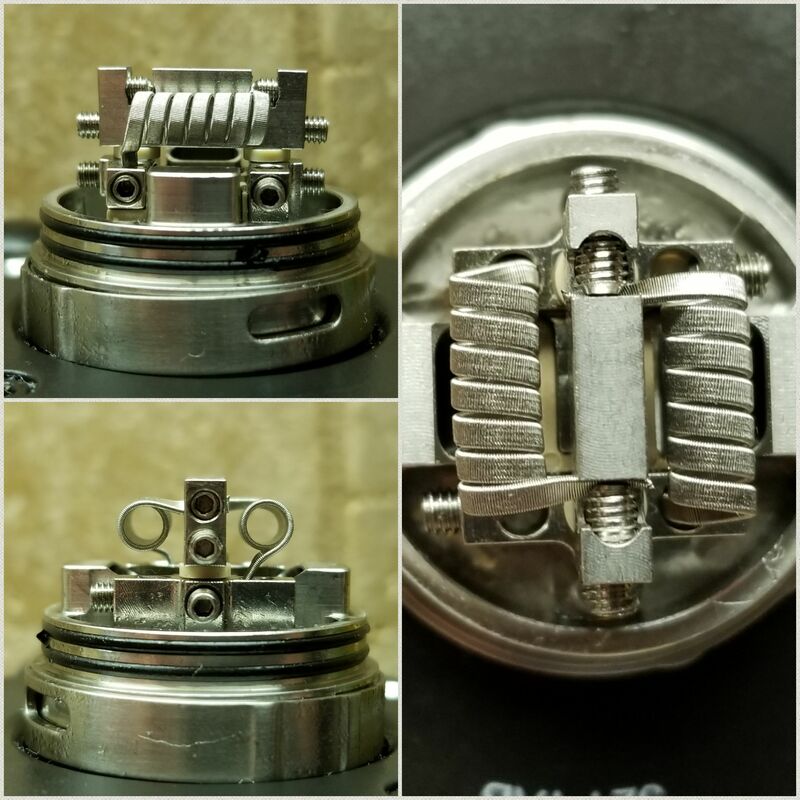 With a traditional dual coil build if one coil is 0.30 ohms adding a second coil will yield a 0.15 ohm build. 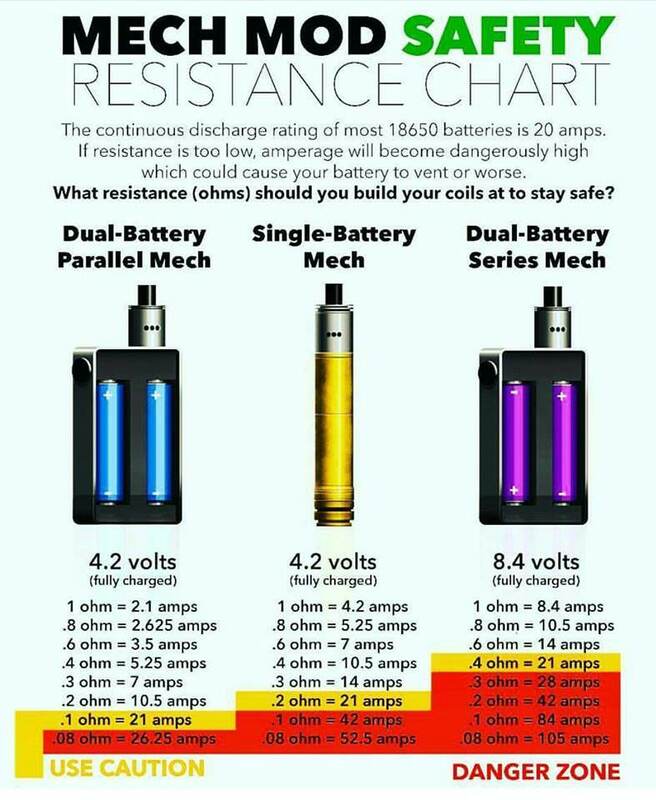 With the series post installed it acts to double your ohms, the same 0.30 ohm coil when adding the second gives you a final build of 0.60 ohms, great for some LiPo mods and Dual Series Mech mods which work best at 0.40 ohms and above, check the chart below. The deck itself is postless design and a thing of beauty that is the usual high quality you expect from Steam Crave. Here shown with the optional squonk pin installed. The outer posts are situated perfectly so your wide builds can be installed without twisting the leads, always a fan of that. The center posts are mainly to hold the optional series posts in place but can be used to install a coil as well. The bottom airflow is angled in towards the coils for flavor and lifted from the deck to help avoid over dripping. Comes with 2 glass tops, a conventional metal top would have been a nice option, maybe something they could add in the future. For those Modfather RDA owners out there good news, you can use the top cap for that on the Glaz RDSA for a different look. Works great but there is some slight flavor loss with the Modfather top cap in place. A great option for high heat builds which can heat up the glass to uncomfortable levels. My review sample did not include the Silicone Mouth Tip Caps which is seems Steam Crave added to the final production units, that is needed for sure and was my biggest complaint. I went through 8 to 10 builds in the 5+ weeks during my review evaluation but will just focus on the 3 that are relevant. First up was a traditional dual coil build, this one here is about my 2nd or 3rd while trying to find the best position for the coils. I found that with the coils closer to the airflow holes and situated a little higher it gave me the best flavor with the added benefit of keeping the glass cooler. I tried the coils lower, more towards the middle and varying degrees of angles to the airflow holes but this build worked the best. 3mm inner diameter 26g dual with 36g outer wrap worked the best for me but tried larger inner diameter coils and well as quad core fused claptons and Aliens with varying degrees of success. I have to say that all the builds worked well, it is hard to get a build to be bad in the Glaz RDSA. The worst builds heated up the glass so much it made it near impossible to chain vape without getting bacon lips. I tried about 3 single coil builds, none of them matched the dual coil build above but this one below was not bad at all. Decided to use a 5mm post with quad core fused clapton and the results were pretty tasty. I initially situated the coil higher but found it to be too hot for my liking, mouth so close to the coil I could french kiss the dragon so to speak. 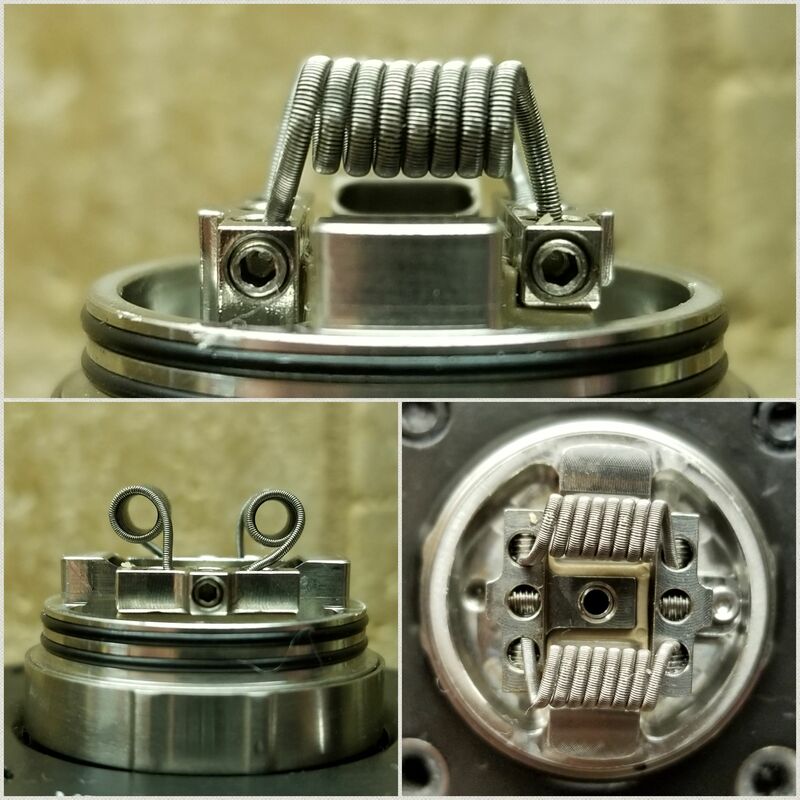 Smaller single coil builds got a little lost in the huge build deck, I would suggest 3.5mm inner diameter coils at a minimum, 4mm inner diameter worked just as well for me. 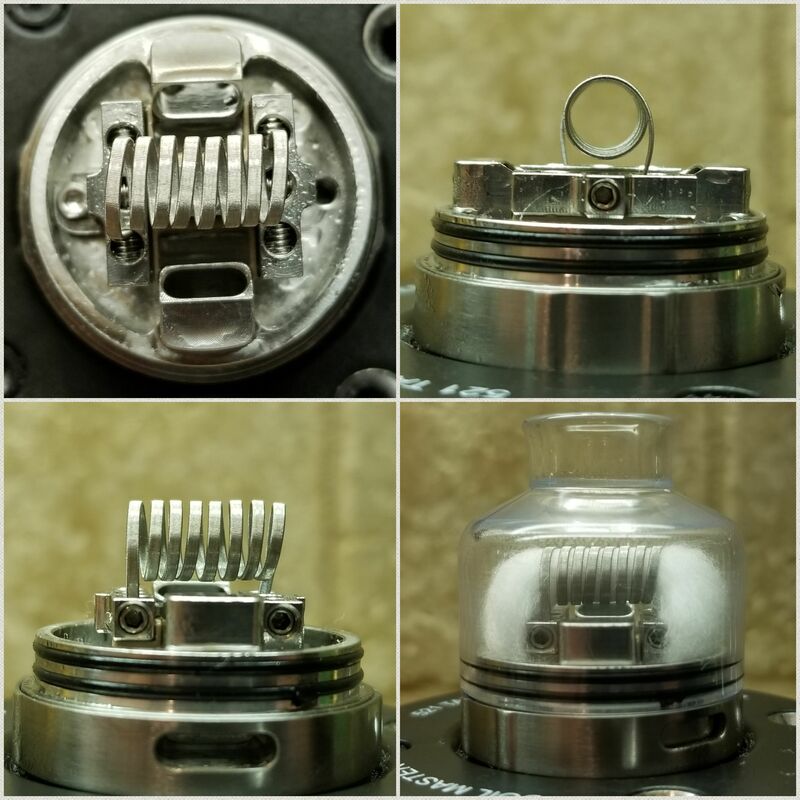 Now here is what makes the Glaz RDSA cool, the Series option which took a build which would normally ohm out at 0.125 when in normal dual coil configuration into a nominal 0.50 ohm build, great for my NLPWM WhiteRose LiPo mod which loves 0.30 ohms and above. The way the series post works is it acts as a null, essentially turning your dual coils into one long coil. The center post is neither a positive nor negative terminal, those are located on the deck itself. With both coils attached to the series post it just works to complete the circuit, you cannot run a single coil with the series deck. Hopefully this makes it easy to understand, if you build (2) 7 wrap coil the series post just connects them and turns them into a continuous 14 wrap coil. The series post uses delrin or another non conductive material to attach to the deck so that it is isolated from both the positive and negative terminals. The coils are connected at the deck itself, one coil gets the positive and the other side gets the negative. While the series deck won’t be used for a majority of the vapers out there it really comes in handy for series mech and NLPWM or PWM mod users such as myself. I loved using the series build above on my WhiteRose NLPWM mod above, if that mod had a squonk bottle on it the pair would be inseparable. I don’t have any affiliation with WhiteRose other than ordering that ridiculously cool mod from him and getting the chance to speak with him on the phone when placing my order. 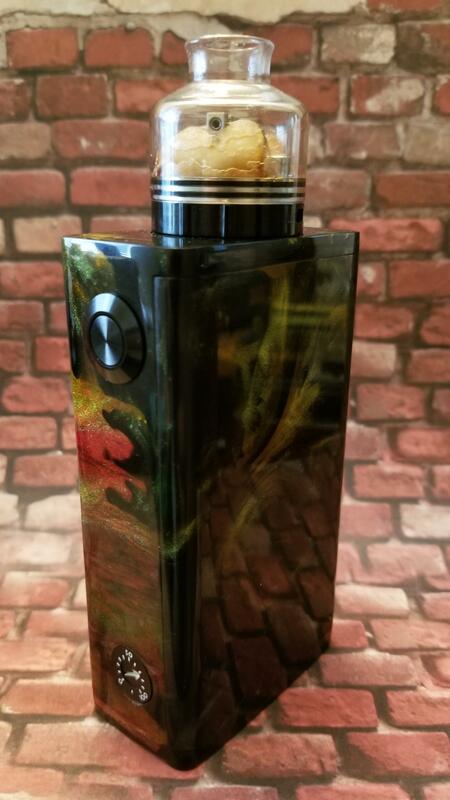 He is a great guy and you can find out more about his products here: https://www.instagram.com/whiterosemods/ Here is another PWM mod I got from him, love his work. All the builds I tried were either good or great, never had a bad build which is a testament to the Glaz RDSA. Flavor just pops with the first dual coil build I posted above and with the added benefit of keeping the glass cooler. That is my main gripe, the glass gets hot, way hot with larger builds but Steam Crave is now including a silicone tip, something I plan to order separately which should come in real handy. I only have (3) 30mm RDA’s in my collection, the Modfather and Cthulhu Zathog RDA’s (review on the later coming soon) of those 3 the Steam Crave Glaz RDSA is the most flavorful, easily my favorite. 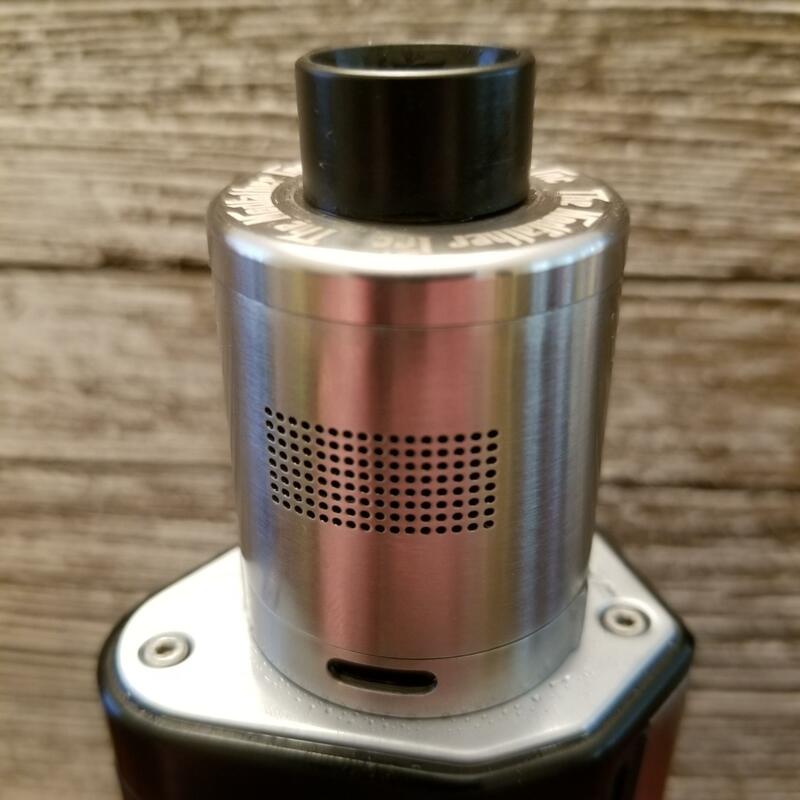 I am just hoping Steam Crave comes out with a metal top cap as an accessory, I would like it a lot more with that option. Aside from the glass heating up my other gripe is the squonk positioning. With my prefered coil placement that leaves the squonk hole right dab in the middle and when you run out of juice it will spit juice right up the drip tip. 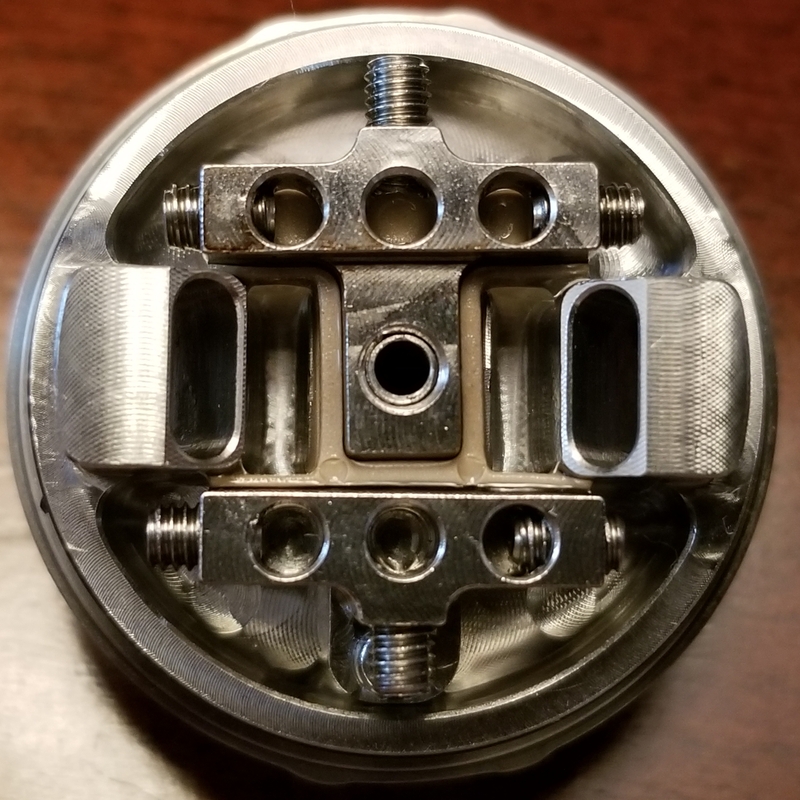 You can stop that if you use a single coil right in the middle to block the squonk hole, same with a triple coil build. You could also place your dual coils close to the middle to block the squonk hole but then flavor suffers. I would have loved it if the BF pin was set up to fill the well below rather that at the top of the deck which then has to run down. This would also help with over squonking which if I wasn’t careful would happen but mostly when I forgot I squonked already. I do find myself being careful when squonking with it so that is a definite con. I will freely admit to being a fan of Steam Crave, the Aromamizer Plus is one of my favorite tanks of all time. 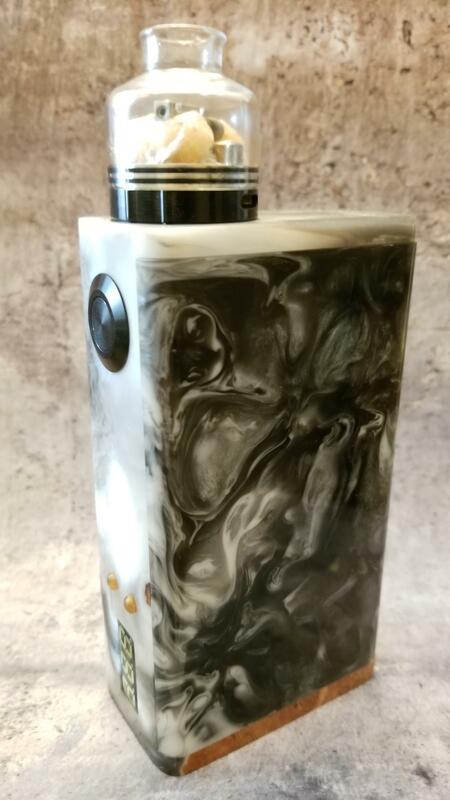 I have never tried a Steam Crave RDA prior to the Glaz but I am impressed, if they fixed the cons I would be even more so. Personally I am not a fan of the glass top cap though, it gets too hot with some builds and would love to see a metal top cap added as an accessory. The squonk pin could be better designed as well, feed to below the deck would have been a lot better. With the dual coil build I showed above I have been vaping it at 95 watts on my Lost Vape Drone squonker for a while now. Really helped with keeping the glass cooler so I can chain vape without frying my lips and the flavor has been great. If the Silicone Mouth Tip Caps which are now included work as intended then this gets an easy recommendation from me, if not then I am hesitant to recommend it. If all that appeals to you then you can order it directly from Steam Crave and have it shipped from New York here: https://shop.steamcrave.com/glazrdsa_p0974.html Look around for discount codes as well, I am not aware of any at this time but if I find one I will update the review.